What is Char Siu, you might ask? What is Char Siu???? You may not ask!! It is only one of the most awesome Cantonese barbecued pork. Now, you might encounter several versions of this. The Chinese (from China) make them, the Chinese (from Hong Kong) make them, and the people who make them best are the Chinese from Malaysia. 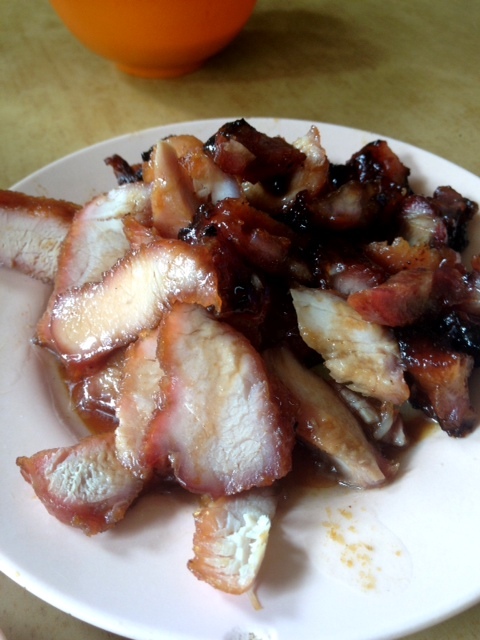 One particular family from the city of Melaka has been making char siu for decades. My mum recalls walking to their stall and buying it from the same man that still sells it now, and she says it still tastes the same from so many years ago! Located at the Medan Selera Bunga Raya on Jalan Bunga Raya, if you come after 1pm, there most likely will not be a crowd.